Stunning good looks, a display with so high resolution, it’d take a magnifying glass to pick out the pixels, and unparalleled performance. The iPad Mini with Retina Display is nearly as great as we hoped it to be. With the new Apple-designed A7 chip, the Mini is even mightier, bringing 64-bit desktop-class architecture to iPad. Any way you look at it, you will be charmed. Here’s a look at the 5 best features of the charismatic iPad Mini with Retina Display. Great screens aren’t hard to come by anymore. With a retina display, the new iPad Mini’s resolution has been upgraded from 1024 x 768 to 2048 x 1536 pixels, four times the resolution of its predecessor. This results in incredible details of photos, videos, and razor sharp text. The 4x resolution makes it easy for apps to be scaled up or down, and enables easy web browsing and game playing, that were markedly less impressive before. The display quality is absolutely consistent between units, and boasts the sharpest screen in its class. The A7 chip makes the new iPad Mini blazingly fast. According to Apple, “The A7 chip offers 64-bit desktop-class architecture, advanced graphics, and improved image signal processing”. Thanks to the new faster processor, apps on the iPad run faster, and the 64-bit architecture brings the futuristic capabilities to the apps. Most importantly, with the power processor, you do not have to compromise on battery life. The Mini with Retina Display easily gets the 10 hours of battery life Apple advertises, and that’s with heavy, constant use, and is definitely a long-lasting tablet. Moreover, the Mini with Retina Display is also equipped with M7 coprocessor, which measures motion from the iPad through accelerometer, gyroscope, and compass. So the apps give you a better performance as per the movement of iPad Mini. Though extremely powerful, the iPad Mini with Retina Display is not battery sucker. The A7 processor and Retina Display do not come in the way of the epic 10 hours battery life of the iPad. With every day to heavy use, one would comfortably hit Apple’s “10 hour” figure. 475,000. That’s how many tablet-optimized apps are in the iOS app store. The apps take advantage of every pixel on the Retina Display, and with the next-generation 64-bit architecture, they run smoothly and efficiently, making the iPad even more capable than ever. Apple has also included a number of free apps this time around, offering iLife and iWork suites for iOS for download as soon as you set up the iPad. That means iPhoto, iMovie, iGarageBand, along with Pages, Numbers, and Keynote, covering the bases from entertainment and lifestyle, through to business and home-office work. With MIMO (multiple-input multiple-output) wireless technology, Apple has bumped up the wireless capabilities of the iPad Mini with Retina Display. MIMO uses multiple antennas to improve Wi-Fi range and throughput. The dual-bands of 2.4 GHz and 5 GHz frequency speeds up the download to 300 Mbps. As the second iteration, you can hardly fault the iPad Mini with Retina Display. 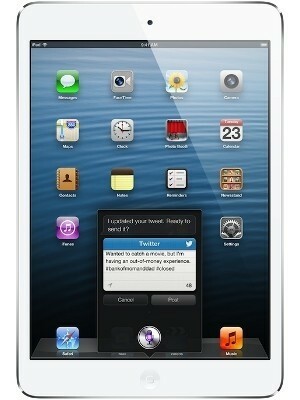 Apple has come up with a great looking and powerful tablet, which is able to deliver on battery life and portability. Available in color schemes: ‘silver’ and ‘space grey’, the iPad Mini with Retina Display, in a compact and elegant design, does make Apple proud.